So it is now time to say goodbye to 2005. I'm not quite sure how I feel about this year. I had some huge ups and downs throughout the year, so much so that at times I wish it never happened. This time last year, I was in Japan and was quite content with the uneventfulness of my life. I honestly can't say the same today. I know I'm dealing with everything the best that I can but if you think about it, "dealing with it" is such a depressing phrase. Here's hope that in 2006, I will be able to say that I enjoy everything that life throws in my direction. Long-sleeved T-Shirt is a wardrobe essential but of course, the "perfect" shirt is elusive to find because material, colour, and cut all play an equally important role. I used to like the Long-Sleeved Favourite T from Gap for it's cut but recently, I felt that it is not feminine enough so it's been relegated to workout wear. Last year, I bought three v-neck long-sleeved T-shirts from Club Monaco. The cut is very flattering...for the first hour. The cotton that it uses is heavy-weight and it loses its shape quickly. What started out as a curve-hugging silhouette in the morning would quickly turned into a rumpled bunch of fabric by lunchtime. When I was in Paris, I went into Petit Bateau on a whim because I seem to remember that fashion magazines have long raved about their T-shirts. I bought a v-neck in dark brown and a scooped neck in black. I didn't think much of the purchase at the time but now that I'm home, I finally realize just how much I like these two shirts. The cut is feminine and flattering, the material is just the right weight (not too think nor too thin), and the fabric is soft yet it holds its shape even after long hours of wear. I think I have finally found my perfect long-sleeved T-shirt...except that we don't have any Petit Bateau boutiques in Canada! Life is not perfect, after all. I'm always on the lookout for recipes that uses ripe bananas because I seem to have a few of those in the kitchen every few weeks. A pet peeve of mine is big cheesecakes. Most of the cheesecake recipes yields 9" or 10" cakes which is simply too big even if I slice it into 16 servings. I think 7" is the optimal size when sliced into 12 servings. Cheesecake is such a rich dessert that smaller servings is probably more enjoyable anyway. Preheat oven to 325F. Line the bottom of a 7" round cake pan (3" height) with a round of parchment paper. Place graham cracker crumbs, sugar, and walnuts in a food processor and process until fine. Drizzle in melted butter to moisten all the dry ingredients. Pat the crust mixture to the bottom of the pan and press with bottom of a glass to tightly pack the crust. Bake until fragrant and slightly brown at the edges, about 15 minutes. Cool to room temperature and grease the side of the pan. Lower the oven temperature to 300F. Using a blender or an immersion blender, puree the banana. Stir in lemon zest, lemon juice, and vanilla extract. Set aside. In a stand mixer, beat cream cheese until smooth. Add sugar and continue beating at medium speed. Add eggs one by one ensuring that mixture is thoroughly incorporated. Lastly, add in banana puree and beat until mixture is smooth. Pour cheesecake mixture into pan and bake until set but the centre is still wobbly, about 90 minutes. Turn off oven and leave the cheesecake inside for another hour. Cool the cheescake to room temperature and store in freezer. It is much easier to unmold and cut into neat slices when the cheesecake is frozen. To unmold the cheesecake, heat the outside of the pan over flames (either a handheld torch or a gas range is great) to loosen the cake. 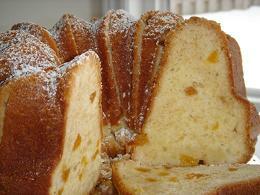 Invert the pan to unmold the cake and cut into slices. Defrost in refrigerator until ready to serve. cranberry scones with clotted cream (recipe from Rose Levy Beranbaum's The Bread Bible): This is probably the most complicate scone recipe I've ever used. After making up the dough, I gave it four turns to give it uniform layers. This method is identical to quick puff pastry. The final product was great though because unlike other scone recipes, each piece rised evenly for a very uniform look. mini potato with sour cream, chives, & tobiko: This is a simple cocktail party staple that is easy to prepare. I simply boiled the new potatos, sliced off top and bottom, and garnished with a dollop of sour cream, chopped chives, and tobiko. I love the vibrant colour of the orange tobiko and the green chives, not to mention the nice flavour that the tobiko contributed. smoked salmon & wasabi mayonnaise finger sandwiches: This is my favourite filling that I make everytime I serve afternoon tea. The wasabi mayo is ready-made but I can just easily mix wasabi powder with mayo for the same effect. My friends love it too. curry chicken salad finger sandwiches: The chicken salad was made with diced poached chicken breast, diced golden delicious apples, mayonnaise, and curry powder. I did not want the salad to be spicy, just a hint of curry. cucumber mascarpone finger sandwiches: I was originally going to make cream cheese and cucumber sandwiches until I found out that I ran out of cream cheese. Mascarpone is much easier to spread and I like its creamy rich taste more than the tanginess of cream cheese. parmigiano reggiano radishes finger sandwiches: I remember reading Susan Herrmann Loomis' essay on black radishes and wondered if thinly sliced radishes really taste great on buttered bread, sprinkled with salt. To be honest, I never bought radishes before because I didn't like its sharp taste in those few occasions that I had it from salad bars. However, since I ran out of ideas for a second egg-less vegetarian sandwich, I took a chance. Instead of salt, I used shaved parmigiano reggiano for the salty element with a more complex taste. The result was beautiful. I love this sandwich. 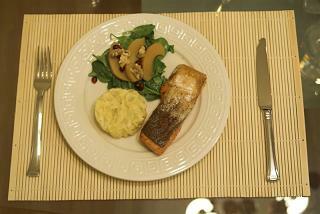 port wine poached forelle pears with mascarpone: Poached pear is an obvious choice for an egg-less vegetarian dessert. 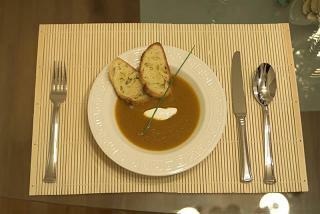 It's simple, elegant, and so easy to prepare. The poaching liquid was a mix of ruby port, cinnamon, vanilla, star anise, orange zest, and orange juice. 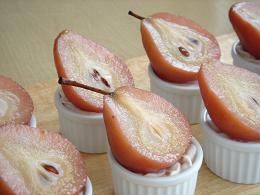 Forelle and Seckle pears are my favourites pears for poaching because of their miniature size. I was originally going to match the pears with creme fraiche panna cotta (just like what I served at Linda a few months ago) but I ran out of time. Instead, mascarpone mixed with a bit of the poaching liquid made for a good accompaniment. apple cranberry crisp: This is what I served for dessert a few days ago when I invited my university friends over for dinner. I assembled and froze each cup ahead of time so I only need to bake them up before serving. The topping is equal part mixture of all-purpose flour, rolled oats, sugar, and butter, with a handful of chopped walnuts thrown in for good measure. 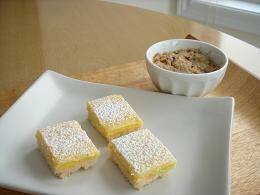 This is another great egg-less vegetarian dessert. almond apricot pound cake with amaretto (recipe from Regan Daley's In The Sweet Kitchen): After reading EF's testing notes on this recipe, I was eager to give it a try. The mise-en-place was complicate but the cake itself was easy to make. The cake was dense but full of complex almond flavour. I would probably make this again for picnics but will cut the recipe by half. This recipe yields a very large cake and took forever to bake. lemon bar (recipe from Rose Levy Berabaum's Rose's Christmas Cookies, available online at Epicurious.com): This is my favourite lemon bar recipe for its bright lemon flavour and buttery tender shortbread base. I made it before this summer and it was an obvious choice for a quick dessert. 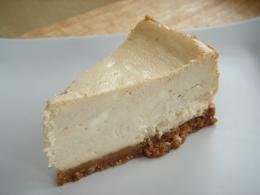 banana cheesecake (recipe available here): I have four ripe bananas lying around the kitchen just begging to be used. Since I already have the almond pound cake in the menu, I decided to use them in a cheesecake instead. I was going to recreate what I served at Linda a few months ago but for the life of me, I couldn't find any notes or recipes for that cheesecake. The cheesecake was wonderfully creamy and bursting with banana flavour. Too bad it cracked. chocolate truffle tart (chocolate pate sucre and ganache recipe from Dorie Greenspan's Chocolate Dessert By Pierre Herme): The final result did not turn out as well as it should because I underbaked the tart shell. However, the ganache was smooth and tasty. I garnished the tarts with fresh raspberries. AG asked me for recipes for every item on the menu. At age 9, he's already quite a budding cook, specializes in marinades and dry rubs. I asked if he would like to bake with me sometime but he offered to make everything at the party based on my recipes instead and I can taste test for him! I like the combination of sweet and salty in a salad. This is a very colourful salad that is quite simple and elegant. Dress the spinach with vinaigrette. Pile everything else on top. My boss' restaurant made it to the top ten places to dine in Toronto this year! This was an unexpected Christmas gift that we received this year. Next year will prove to be challenging and the first challenge will be hosting the monthly dinner for La Chaine des Rotisseurs in January. We've already submitted our menu and everyone at the restaurant is really excited about this event. Ooh, I'm going to get my own chef jacket at last! I was very disappointed by a piece of news that I received. If I haven't learnt my lesson already after all these years, I should know by now that high expectation can only lead to bitter disappointment. I was on my way to J-Town for some grocery shopping in preparation for the party this Friday but all I could do was to sit in the coffee shop and cry. It's been such a long time so It should not hurt this much but it did. 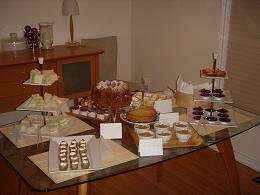 Fortunately, I was comfortably numb by the time I finished some last bit of preparation for the dinner party. 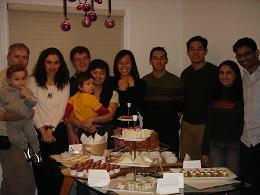 I dropped by VL's party and was glad to chit chat with friends for a little. I had a hard time concentrating on the conversation though...I'm sure I said the same thing over and over again like a broken record. Oh well. Time to get ready for my own party. Thanks to WS for taking lots of pictures during the party! The pictures are available here. Catholic school girl: Okay, this is an easy one with my love of pleated plaid mini skirts, knee-high socks, and mary-janes. Just throw on a white shirt and I'm ready. Need I say that I actually never attended Catholic school? Flamingo Dancer: I have a 3-tier black lace skirt from Club Monaco that I've only worn once. For whatever reason, it looked great when I bought it but I couldn't quite work it into any outfits that I like. I worn it today with a black silk camisole, a fringed black organza shawl, and black mary-janes. Lo and behold, I looked like a flamingo dancer. All that was missing was a side chignon adorned with a huge red flower. Gypsy: This is not such a stretch given the bohemian style that has been all the rage for the past couple of years. I worn an ankle-length cream coloured tier skirt, a drawstring black peasant blouse, a fringed black shawl, silver bangles from India, purple beaded choker, and gold chandelier earrings. Good props would be a set of tarot cards and a crystal ball. I sure hope this is not a wake-up call to seriously re-evaluate my taste in clothes.